The Divine Liturgy of St John Chrysostom is an important part of the liturgy of the Russian Orthodox Church. John Chrysostom is one of the main early church fathers and is honoured as a saint in the Eastern Orthodox and Byzantine Catholic Churches. "He is known for his preaching and public speaking, his denunciation of abuse of authority by both ecclesiastical and political leaders", according to Wikipedia. That aspect also comes to the fore in the conflict which is the subject of the oratorio San Giovanni Crisostomo by Alessandro Stradella. It takes us to the time when John Chrysostom was archbishop of Constantinople. He criticized the extravagances of Aelia Eudoxia, wife of Emperor Arcadius, who had her statue erected in the Augustaion, near the archbishop's cathedral. John denounced the pagan dedication ceremonies and compared her to Herodias, the daughter of King Herod who asked him to give her the head of John the Baptist. This resulted in his exile. This oratorio is surrounded by mysteries. It is not known when it was written nor when or where it was first performed. Luca Della Libera, in his liner-notes, suggests a connection with the papacy of Innocent XI (1676-1689). His namesake Innocent I was the pope who came to John Chrysostom's defence and sent missions to Constantinople. No separate copy of the libretto has been found and as a result we don't know who was its author. As the manuscript of Stradella's oratorio only mentions John Chrysostom and Eudoxia explicitly the identity of the other characters has to be deduced from the story. In the libretto in the booklet these are italicized. The first recitative - scored for tenor - is given to a testo, a role which appears in most oratorios by Carissimi and his immediate successors in this genre. One could compare it with the role of the Evangelist in Bach's Passions. However, here this character doesn't play any part during the oratorio and only returns at the end; there it is surprisingly given to the second soprano. It is assumed that in the other recitatives and arias the tenor represents Theophilus, Patriarch of Alexandria who was a firm opponent of John Chrysostom and is portrayed in the oratorio as a slavish follower of Eudoxia. The role of the alto is identified here with an envoy from Rome (Inviato di Roma), sent by Pope Innocent I. The minor characters cannot be identified; some of the duets - for instance the one that opens the work - are given to Eudoxia's counsellors. One could divide Italian oratorios of the late 17th and early 18th centuries into two categories. Some were written for performance during Lent and - although they could take different subjects from the Bible or the lives of saints - conclude with a reference to the Passion of Christ. Others have a more general edifying character and reflect the ideals of the Counter-Reformation. The present oratorio belongs to the latter category. It is a musical representation of the moral message of John Chrysostom. This is summed up in the recitative which closes the piece: "In vain do the godless hope that the cloak of royalty will serve them as a shield against extreme misfortune: God is not unwilling to strike monarchs down". The fact that the oratorio ends with a recitative is quite surprising. There are more remarkable things here. The scoring is for five voices - which was common at the time - and these were also to sing the choruses. However, in this oratorio we find only one very short chorus. The other ensembles are duets and trios. Moreover, the instrumental scoring is confined to basso continuo; there are no parts for strings. Most arias are rather short and only a handful show early forms of the da capo which was to become the standard in later oratorios. Those were also increasingly close to opera. That is not the case here: this work is not really dramatic. When Eudoxia decides to send John Chrysostom into exile we don't hear a direct dramatic confrontation between the two. This oratorio is basically the account of a dispute between two characters of strongly opposing moral convictions. In addition to the conversations between Eudoxia and John Chrysostom we hear dialogues between their respective followers: the views of the former are supported by Theophilus, those of the latter by the envoy from Rome. Stradella was one of the main Italian composers of his time and his music was in great demand. This oratorio attests to his skills, for instance in his depiction of textual elements and the use of harmony for expressive reasons. Luca Della Libera gives various examples in his excellent liner-notes. A couple of observations should suffice. In the duet 'La morte n'addita' (18) John Chrysostom and the envoy sing different texts but in the last section the latter sings the text which was first sung by John, which evidences support for his case. Their duet 'Alme ree' (20) ends with the words "silences truth" which is graphically illustrated by the harmony. Chromaticism and dissonants are used for the words "sorrow, boredom and tears" in the trio 'Al tuo merto' (38). Since there are no instruments to illustrate elements in the text with melodic phrases expression completely depends on the vocal parts. This oratorio shows that Stradella was a brilliant composer for the voice. This is pretty much an ideal performance. 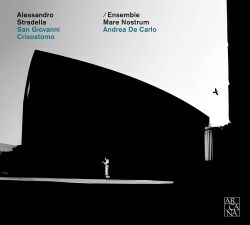 Andrea De Carlo has brought together a fine team of soloists who show a good feeling for Stradella's idiom. They explore its expressive and dramatic features without exaggerating them. After all, this is no opera. However, it is important that there is a good interaction between the protagonists, and that is certainly the case here. There is no incessant vibrato and as a result the voices blend perfectly in the duets and trios and in the only chorus. The soloists receive fine support from the basso continuo group which plays with rhythmic flair. In short, this is an outstanding production, and I hope that these performers will take care of further compositions by Stradella. There is still much to discover in his large output.